[CHICAGO] — In an all Wilson final, Juan Martin del Potro defeated world #1 Roger Federer to earn his first Major title. The 6-foot-6 Argentine held strong throughout the entire five set match. He put aside a losing record against Federer and came out ahead 3-6, 7-6 (5), 4-6, 7-6 (4), 6-2. Del Potro took the edge on Federer by earning 73% of his first serve points and smacking 57 winners across the net, often with his devastating forehand. Del Potro is the second Argentine ever to win the US Open title, joining Guillermo Vilas, who won the tournament in 1977. At the age of 20 years and 355 days, del Potro is the youngest US Open finalist since Novak Djokovic finished runner-up to Roger Federer in the 2007 final, aged 20 years and 100 days. With his [K] Six.One 95 racket, this standout player will rank fifth in the world next week and is the youngest player in the Top 10. 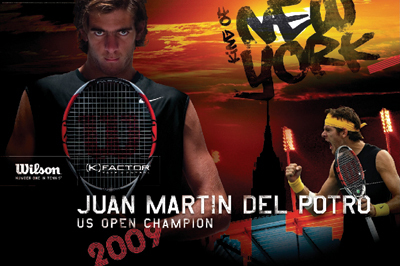 With Wilson since he was 14 years old, 2008 became a defining year for Del Potro, with his meteoric rise from top 40 to top 10. He now continues his strong run during 2009 reaching the QF or better in 11 of 13 tournaments. Most recently, del Potro opened the Olympus US Open Series by successfully defending his Legg Mason Tennis Classic title in Washington, D.C. He defeated Andy Roddick in the final to become the first back-to-back winner since Andre Agassi in 1998-99. The following week at the Rogers Cup in Montreal he beat both Rafael Nadal and Andy Roddick to reach his first ATP World Tour Masters 1000 final. Wilson is proud to support this rising champion on his first Grand Slam title and looks forward to his future success. Wilson Racquet Sports is a division of Chicago-based Wilson Sporting Goods, one of the world’s leading manufacturers of sports equipment and owned by Amer Sports. Wilson designs, manufactures and distributes sporting goods throughout the world and focuses on making technologically advanced products which help players of all levels perform better. Wilson’s core sport categories include: Football, Basketball, Baseball, Volleyball, Soccer, Youth Sports, Uniforms/Apparel, Golf, Footwear and Racquet Sports (Tennis, Racquetball, Squash, Badminton and Platform Tennis). For more information, visit www.wilson.com.